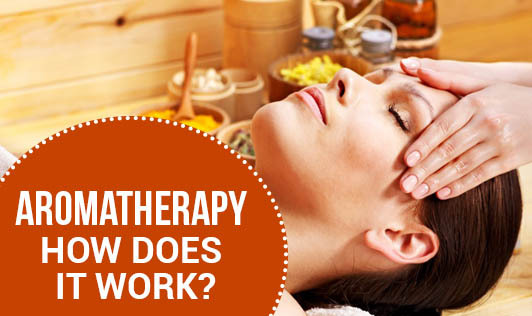 Aromatherapy: How Does It Work? Aromatherapy is the ancient science of healing, relaxing and energizing by the use of plants and their parts. The word aromatherapy is derived from two words ‘aroma' which means smell and ‘therapy' means healing. It is the practice of using the natural oils extracted from different parts of the plant like flowers, bark, stems etc. to enhance psychological and physical well-being. Aromatherapy is gaining momentum as a form of alternative medicine. Practitioners of aromatherapy believe that fragrances in the oils stimulate nerves in the nose. Those nerves send impulses to the part of the brain that controls memory and emotion. The aromas in the oil are thought to interact with the body's hormones and enzymes to cause changes in blood pressure, pulse, and other body functions. Another theory suggests that the fragrance of certain oils may stimulate the body to produce pain-fighting substances. Inhaled aromas are thought to act much more quickly than applying essential oils to the skin or taking them by mouth. Depending on the essential oil used, these effects may include feelings of relaxation, stress relief, calming, and others. Aromatherapy is done using plant's aroma-producing oils called essential oils to treat diseases. Essential oils are taken from plant's flowers, leaves, stalks, bark, rind, or roots. The oils are mixed with another substance such as oil, alcohol, or lotion and used in various ways. When inhaled directly or when sprayed in air, aroma from these "essential" oils is widely believed to stimulate brain function. It can also be massaged on the body, where the oil is absorbed into the skin to travel through the bloodstream and can promote whole-body healing. It can also be poured in the bathing water. There are a wide number of essential oils available, each with its own healing properties.